On the night before classes started for the Fall Semester, thousands of new Penn State students streamed into Rec Hall for a giant pep rally to kick off the year. The Lion Ambassadors—one of the Alumni Association’s two student groups—organizes “Be a Part From the Start” every year, to make the new students feel welcome and teach them how to be a properly enthusiastic Penn Stater. 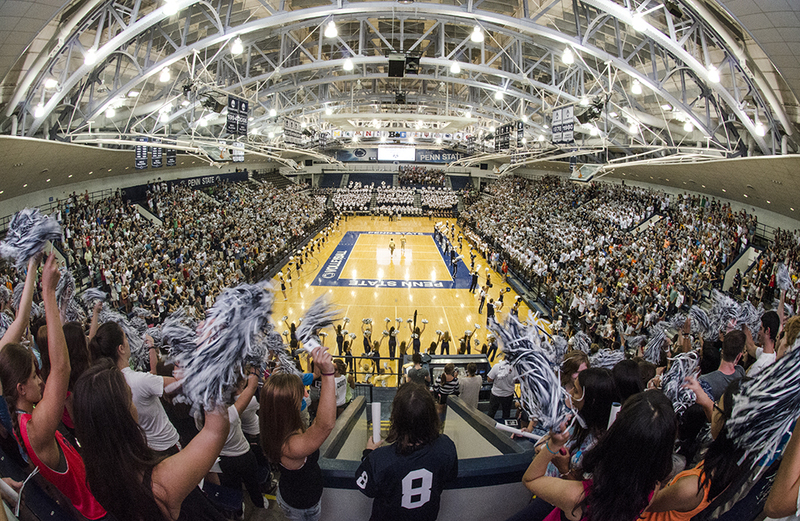 And do they ever do a good job of it: Rec Hall last night was packed and loud, and all the stars came out, from the Blue Band to the cheerleaders to Bill O’Brien to the men’s hockey team to Mike the Mailman. There were shakers and fight songs and “We Are” chants. There was The Wave, including the speeded-up and slow-motion versions. The Glee Club taught the students the fight songs, and the organizers even gave away an iPad or two. And it seemed like about every 10 minutes, someone was launching T-shirts into the crowd. After men’s basketball coach Patrick Chambers and football coach Bill O’Brien did their part to fire up the students, and a video showed the 25 things you have to do while you’re at Penn State (“Visit Mike the Mailman” drew a big cheer), the men’s hockey team showed up, complete with jerseys and sticks. Coach Guy Gadowsky talked about packing the new Pegula Ice Arena for home games: “That arena was built for you,” he told the students. “The student section is right over top of the opposing team’s goaltender. After that, the hockey players used their sticks to flick even more bundled-up T-shirts into the crowd. Even the event organizers weren’t expecting that—it was a great touch and and a great way to get students pumped about Penn State’s newest varsity sport. Here’s a slide show of some photos from last night’s event. Entry filed under: Alumni Association. Tags: Be a Part from the Start, Blue & White Society.